Bentley’s Popcorn™ Peachtree City, Georgia, was founded by Stephen Dale and his family to develop and market a new line of premium coated popcorn products. Bentley’s Popcorn prides itself for having attained a toehold in an established industry through innovative marketing. The company was named after Bentley, the Family’s much-loved Wirehaired Fox Terrier. Bentley was deaf but had a keen sense of smell. He loved popcorn and his sense of smell was so acute that the Dale Family could never successfully hide popcorn from him, try as they might. So the Dale Family decided to use Bentley for the brand name and to feature him as the central company character. An actual picture of Bentley is part of the company logo. The company also plans to donate a portion of its sales revenues to The Homeless Pets Foundation, an Atlanta-based non-profit foundation that provides critical care, food, foster care, and comfort to homeless animals. Bentley’s first made its product available to consumers with the launch of its eCommerce Web site. The first of a five-method sales approach that also includes: 2) vendor agreements with large and established outsource food service managers and providers; 3) non-food and high-end specialty food retail store and local event distribution; 4) corporate gifts; 5) non-profit fund raising. 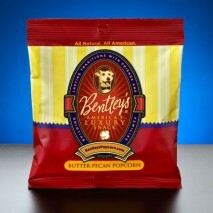 Bentley’s Popcorn offers pre-packaged premium coated (glazed) popcorn with nuts. Bentley’s products are second to none in both quality and taste. Bentley’s whole grain fresh corn kernels are popped to perfection and then coated with the freshest all natural ingredients blended in secret recipes developed through rigorous taste testing and pre-packaged for sale to consumers. Bentley’s popcorn products are served to customers in colorful, separately sealed bags and boxes bearing the company logo and in decorative tins available in three sizes. STEEM was hired as a marketing consultant, and to design and implement tactical components of the Bentley’s Popcorn marketing strategy. The approach included traditional and innovative methods for generating awareness, sales, and positioning Bentley’s as a line of premium snacks for all occasions. For its innovative work on Bentley’s Popcorn, STEEM was a finalist in the Atlanta Business Chronicle’s MAX Awards.